It's been a long time since I've thought of the palatial golf courses and immaculate tennis courts of home; Princeton, NJ, not surprisingly, has a country club or two. But tomorrow's gorgeous shoe shot suddenly had me dreaming about tennis whites and afternoon cocktails, so this week is inspired by a chic celebration in the great outdoors! 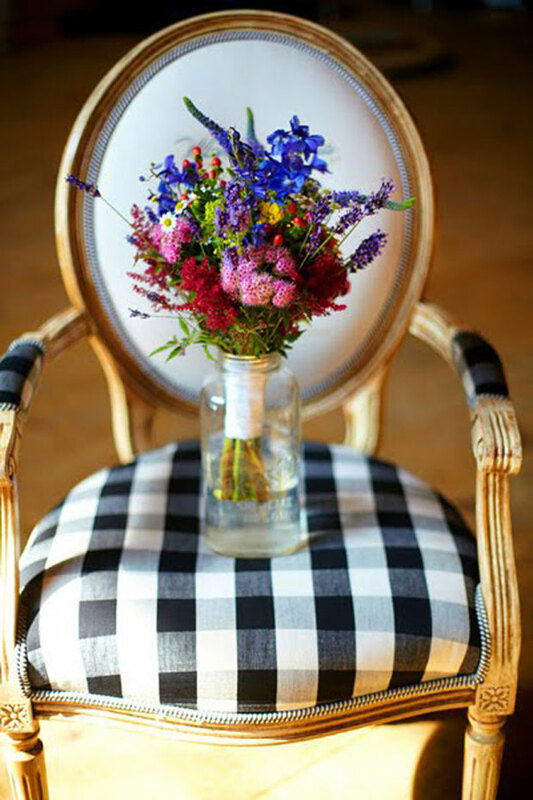 This colorful, rustic bouquet stored in a mason jar and perched on French armchair upholstered in gingham check plaid was the perfect combination of country club elegance and colorful organic elements to kick off this week! As for our weekend: after the office happy hour on Friday afternoon, I fled to John's bar for lots of water and plenty of Chinese food (he recently started bartending at Heaven's Dog again, so if you're craving a craft cocktail in San Francisco, now you know where to go!). Saturday was a deliciously lazy day at our computers, and after a big Sunday brunch, we took the most divine stroll on the beach! Armed with a Soviet-era Stanley thermos of Mexican spiced hot chocolate and our current reads, it was a perfect afternoon! This is gorg. I love that you had a lovely weekend. I wish I could have good Chinese here. lovely picture! Your weekend sounds like it was amazing, too. Is it chilly enough there for hot chocolate already? It's been well into the 100's here! Sounds like a dream weekend! Love the bouquet "sneak peek" of the upcoming posts. WOW! that is one of my favorite bouquet shots ever. I love that gingham chair! oh that chair and those flowers..so perfect! Ah sounds like the perfect weekend! I used to play tennis. Should get back into it, ha! LOVE the chair, wish I lived closer to go to John's bar, sounds like a fab weekend and can't believe you are from Princeton....lots of family from there!! I am so envious of your dreamy sounding afternoon! I wish I had a car, or we had better transit to the smaller towns here... many are quite dreamy but inaccessible without your own wheels! Sounds like the perfect day!! And the bouquet is so simple but extremely elegant!!Beautiful! I'm really curious to know how to make mexican spiced hot chocolate- we are big time cocoa drinkers here. what a lovely bouquet! we just booked a florist and i can't wait to see what he comes up with! glad you had a great weekend, doll! Your weekend sounds glorious. I thought of you this weekend while I was crafting up some signature cocktails for an assignment. I was longing for your stocked bar and liquor knowledge! what a picture perfect photo, I love everything about it! how appropriate! ed had to go to some business dinner at a country club in long island tonight. i dressed him appropriately in a polo shirt and blazer. he decided that's as preppy as he could go. trust me, i could have done way worse. Sounds like you had a lovely weekend. Sounds like an awesome weekend! mmmm Mexican hot chocolate! I love the combination of the rustic mason jar with the intricate detailing on the chair. Beautiful. Sounds like you had a wonderful weekend! Just curious, what are your current reads? I'm looking for some new reading material! I want John to get to SoCal and bartend for the Chef!! Imagine the shenanigans we could have!! i dont like hot chocolate but i recently tried lindt chili pepper dark chocolate...delicious! Lovely picture, those flowers are stunning! That sounds perfect. Today is definitely a Mexican hot chocolate sort of day.